LNER A1/A3 class 4-6-2 Sunstar 2571 “one off”, which realised £737. The Hornby Dublo section contained some rarely seen locomotives, boxed, and in superb condition. BR maroon 46247 City of Liverpool 4-6-2, excellent, with yellow tested tag, in good plus picture box, realised £973. This model had a very short production run. 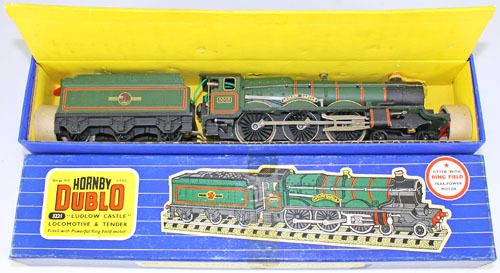 BR green 5002 Ludlow Castle 4-6-0, nearly mint, with yellow tested label, in excellent box, realised £519. BR green 34042 Dorchester 4-6-2, about mint, with yellow tested label, in good plus box, realised £424. Class 501 SR green S65326 + S77511 2 car 3 rail unit, excellent plus/about mint, in good plus boxes, realised £436. BR maroon E1939 restaurant car, no. 4071, about mint, in excellent box, realised £141. Are you selling model railways, we provide free model railway valuations without obligation. Please contact model railways expert richard.beale@warwickandwarwick.com if you have model railways for sale. Our next Model Railway auction will be held on Wednesday 18th March 2015. The full catalogue for this sale will be on our website in the next few weeks. Check our Twitter and Facebook accounts which include updates and our latest auction news. Selling model railways? Phone Richard Beale on 01926 499031.